Bain & Company published their 2015 Management Tools and Trends survey this summer (conducted in 2014). In this survey, they rate 25 popular management tools by usage and satisfaction every two years. The survey is based on more than 13,000 participants from all around the world. Thus, it should give a fairly reliable view on how these tools prove their worth in practice. Obviously, strategic planning is still among the most popular management tools around. In terms of satisfaction, strategic planning ranks on place seven (grade 3.93 with 5.0 being highest possible grade). The tool with the highest rank for satisfaction is Big data analytics (grade 4.01) and the tool with the lowest rank is Outsourcing (grade 3.61). This isn’t a bad result for strategic planning at all. We may now wonder if the critique of strategic planning is mainly existent in management writing. Or do managers surveyed have a false image of themselves and their businesses? One cannot help thinking that managers fail to fully cope with the challenges of complexity in our business environment. They seem to struggle in making sense of the disruptive changes going on around them. It is admittedly hard to grasp what these changes mean for the individual business and what to do about them. For lack of better approaches, they probably rely on what they are familiar with and what has worked for them in the past. As long as the business isn’t hidden hard by any disruptive change, you might think that your old tools still work well. It would be interesting to know if there is a difference in the strategic planning processes of Asian and American businesses and how this may look like. One reason so many respondents in the survey view their company as poised to outperform is the tendency of individuals to be overconfident in their assessments about the future. This bias, along with the unfortunate fact that most aren’t mentally wired to chart a path into an environment of change, chaos, etc. Hence the reason that strategic planning is embraced by many (and likely not understood by an equally large number!) Good post…enjoying starting to read your material! In my opinion, this applies especially to those businesses that have been in existence for some time. Even if they sense that they have to adapt new approaches, it is much harder for them compared to an agile startup. 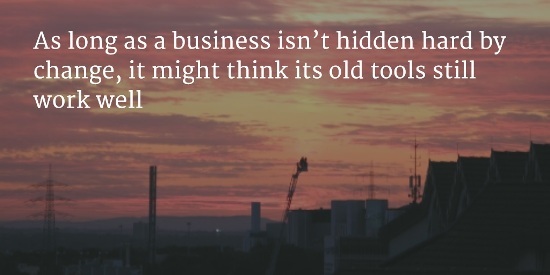 Existing businesses have legacy systems and processes, collective memories and believes and so on. You are much more reluctant to make major changes on those, than on an minimum viable product.